With every word we speak and every action we take we are contributing to collectively creating our future. Isn’t it in our best interests to give some thought to this process? The last great extinction event on Earth? It’s happening all around the world. Once thriving oceans, seas, lakes, rivers are dying. People are experiencing various forms of cancer at unprecedented rates. Also hypothyroidism, diabetes, and other diseases are increasing in prevalence. Then there are the dis-eases often categorized as mental disorders: anxiety, depression, anger, and more. What do all these things have in common? All of these maladies, environmental and human, are either caused or exacerbated by one or more of the various forms of pollution which are rampant in our world today. These forms of pollution include pollution of our water, air, earth, bodies, minds, and spirits. Many types of corporeal pollution are listed above. Regarding our minds and spirits, we are currently experiencing widespread pollution of human kind by greed, fear, hate and anger. It only takes picking up a newspaper to find instances of this pollution at work. Who to blame, or is there anyone to blame? Do we always have to look for someone to blame? In this case, yes, there most definitely are people at the root of the problem. One source; a company, a government, a religion, or other agency with financial or other special interests produces “X” amount of physical and/or mental/spiritual pollution, another company produces 2 times as much. Another company maybe only produces 1/2 as much. And all of them are saying that they do not produce enough pollution to be causing such problems. And all of them are right. And all of them are wrong. If you aren’t familiar with Aesop’s fable of the “The Crow and the Pitcher”, I hope you’ll read it. It explains a lot. Regarding the mental/spiritual pollution, what human agency is watching out for the common person? At this point, no one. We are pretty much on our own to decide what ideas, beliefs, we incorporate into our lives. Which, in order for us to retain our humanity, is as it should be. Free will is a wonderful thing. Yet, why are so many so quick, so willing to incorporate ideas filled with greed, hate, fear and anger? One reason, I believe, is because those are the ideas people are being repeatedly exposed to by, again, those with the reins of power around the world. Around the world, we see people being led to embrace greed, hate, fear and anger en masse by those whom those people trust to tell them what’s happening in the world. Special interests have most definitely infected many of the media, schools, and religious institutions. I heard a proverb years ago that: “When interest enters in, truth flies out the window.” Again, it’s a matter of no one contributing source being the whole problem, and again, the fable of “The Crow and the Pitcher” tells the story. Don’t we see what’s happening? Don’t we understand the real and potential problems associated with pollution? Don’t we, with all our technology, possess the means to prevent and correct such problems? The answer to all these questions is the same: “Yes we do”. However, there is another question and an answer which, together, underlie all these problems: Don’t those with the reins of power around the world possess the wisdom and will to value our planet’s ability to sustain life, and the myriad benefits of humankind cooperatively coexisting, more than the unbridled acquisition of power and material wealth? Unfortunately at this time, the answer to that question which we are seeing repeatedly demonstrated is: “No”. Too many people want their stock dividends, too many CEO’s want their large bonuses, the power and influence of too many public offices are for sale. Amongst the common folk, apparently too many people are contributing to the culture of pollution with the purchases we make. To some extent we are at the mercy of those in control of production and marketing. However we should all be mindful of the impact our purchases have upon the burden of waste in the world. And, I would add, too many are too readily accepting the “reasoning” being put forward by those in power for why our natural resources and our treasuries are being managed in the way they are. And too many people are accepting the special interest driven “reasoning” being offered for why we should embrace greed and hold hate, fear and anger toward others. I think at some point in the future when archeologists, quite possibly from another planet because Earthlings will have become extinct, look for the “whys” to the last great extinction event on Earth, they will find a direct causative chain of: human greed – pollution – willful ignoring and exacerbating of the problems – extinction. I am using the same artwork for this article as the last one because, well, it is just so appropriate. And I would rather think optimistically then post a picture of the pollution, and it’s effects, which we can all see without any great effort. This is a “laundry list” of things which, if put into effect, would go a long way toward effectively stabilizing human culture, re-humanizing humanity, doing away with war, decreasing the prevalence of many illnesses, and making life worth living! None of these, except one (I won’t say which one), are my original ideas. They are from people who have studied the issues and weighed the related factors. As I have accumulated them over years I apologize that I do not cite the source. In the interest of brevity I have sometimes combined what were originally separate ideas but which dovetail nicely together. A three day work week with a living wage. Abolish the stock market. Keep companies in the hands of their founders and workers (employee ownership). Let the consumers decide via their purchases, or lack thereof, when a company’s product is no longer desired. New ideas for products/companies can be financed via bank loans, personal loans or the sale of bonds. All at a reasonable rate of interest and able to be paid off. All industrial or other waste which poses a threat to the health of our environment must be discontinued or treated in such a fashion as to effectively neutralize any threat it may pose. Legalize the production, sale and use of all natural substances which may be categorized as “drugs”. These include marijuana, coca, poppies and their derivatives. No prescription needed for these substances. 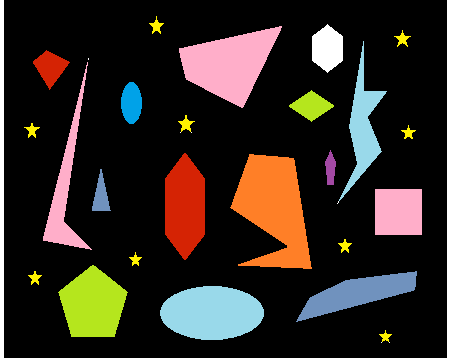 In order to purchase these substances a person must have a card indicating they have completed an introductory class of at least 3 hrs. in duration about the potential dangers and benefits of each substance they wish to be allowed to purchase. Including tobacco and alcohol. Re-institute regulations around the number of television stations, radio stations, newspapers and other media outlets that any one person or corporation may own. Via regulations affecting banks, arms manufacturers and other government contractors, remove the the profit motive from war. Make the dissemination of false and/or misleading information by elected and/or appointed government officials/employees a criminal offense (if it isn’t already) and enforce it. Restrict election financing. Cap the dollar amount any one candidate can spend during an election campaign. Make it a felony with significant penalties for any person, corporation or foreign nation, or any agent thereof, to give donations, gifts, or make promises of future financial/material gain to any elected or appointed government official/employee. Or for any elected or appointed government official and/or employee to receive such donations or gifts. Maintain and adequately fund community based (not private) and regulated police forces, fire departments, schools, parks, hospitals, ambulance/EMT services (universal healthcare) and other services. Such as concert and sports venues as a community desires and can support. Income from concerts, sporting events, etc, above and beyond that used to pay workers, performers, athletes, etc., should go to public coffers and to fund public services and infrastructure. Establish and enforce both a minimum and maximum personal income. The minimum income would insure basic housing, food and essentials for all. There could be some work requirement (public service) upon those receiving it. The maximum income would include income from all sources combined. This would be in force for all people regardless of profession. The maximum income should be no more than 7 times the minimum wage (not the minimum income which may be slightly less than the minimum wage). While in a rough draft format, as mentioned above this is at least a partial “laundry list” of actions which, if instituted, would serve to stabilize and re-humanize our cultures and our world. Respecting our individual developmental imperatives. 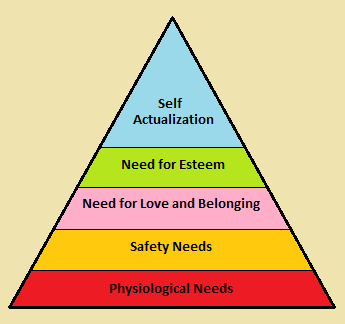 Why do I use Maslow’s Hierarchy of needs so often in my articles? Because it informs us of a universal key to a successful life as an individual and as a culture. Culture. We all need one to live. However, if and when that culture becomes too rigid, too intolerant, it stops being the supportive, nurturing, positive context we all need for whole, healthy lives. We human beings are complex in our make-up, in how it is that we experience our world, our environment, and in how we, as individuals, want to respond and behave within it. Each of us, while we do all share an essential common core of basic needs: water, food, air, shelter, love…, as complex beings are also very different in many ways. We all experience and relate to our world in a somewhat different manner. Some people are more oriented toward an auditory experience of the world. Some the visual, or the tactile. And there are many other aspects of our lives which we all approach in different measure, with varying degrees of passion. We all have available to us the realities of logic, mathematics, healing/medicine, art, architecture, music, taste/food, physical capabilities; balance, strength, motion, sensuality. There are so very many aspects of our lives and our world which we all can and do find ourselves drawn to, interested in, to varying degrees. And they are all equally valid*. What we find ourselves naturally drawn to is the path we need, as an individual living organism with both physical and spiritual components. The path which will lead us to realizing our individual developmental journey in this life. It is, in fact our developmental imperative. And, again, they are all equally valid*. This reality, of individual developmental imperatives, while so common sensical and simple at it’s base, has profound implications for us within our cultures and interpersonal relationships. Currently, in many cultures, there is an expectation, sometimes a quite rigid expectation, that within the culture we should all follow a highly regimented common path. This can, and often does, apply within our interpersonal relationships and especially marriages. It can, and often does demand, that one party accept a subservient relationship to the other. Often, but by no means always, the subservient role is expected of the female. It is hard, real hard, (all but impossible?) to get in touch with and express one’s individual developmental imperative in such a situation. Someone may want to attempt the argument that then the subservient person is experiencing that difficulty then that is their developmental imperative at that moment (to learn it is impossible to experience self-actualization while being rigidly held to someone else’s expectations and rules?). What do you think? Within healthy interpersonal relationships we often take on obligations. Couples take on the obligation of maintaining a household, raising children, working together toward common goals. Honoring one’s own developmental imperative does not mean being defiantly independent and resisting all cooperative efforts and arrangements in our lives. It does mean being in touch with and honest with ourselves. Honoring what we know to be our essential orientations and needs. When partners recognize this reality within their own and their partner’s life, and when the individual orientations and needs are not incompatible with the needs that exist within the partnership, then all’s well. As a matter of fact, it’s better than well, it’s excellent. The only way it gets any better is when partners within a relationship not only recognize and honor one another’s individual developmental imperatives, but take an active interest in seeing one another succeed in expressing them. Today in the world at large we see individual developmental imperatives being honored, or neglected, to varying degrees. Some cultures all but totally reject it. When a brutally enforced totalitarian expectation of conformity is present, individual developmental imperative hides in fear. Or there may be martyrs in it’s name. The individual developmental imperative seems to most often demand our attention by being gently insistent. However, if continually repressed there can be pressure that builds up behind it. It can cry out within our being for recognition and expression. The same is true within families, or interpersonal relationships and marriages. It can require determination and personal effort in developing knowledge and reason for individual developmental imperative to find fertile ground. Personal insecurities can get in the way of one’s own ability to express one’s developmental imperative and it can cause us to try to repress it in others. Within close relationships knowledge of one another combined with trust and reliability are important. We don’t come into this world “blank slates”. We arrive with a developmental imperative already well underway. Our spirit, our mind, our nervous system are already geared for the path that will serve us the best. And, if we are happy and accomplished at a skill which brings enlightenment, joy, and increased turn-on to life and well-being to others…then it is a win-win-win situation. Again, there is work involved, and discipline. Work and discipline are not bad things when applied to the expression of that which we deeply love and seek to honor with our being. In that context work and discipline feel right and we recognize the value they can add to our achieving that which we desire. *So why the asterisk, the caveat? Because there is something we need to acknowledge and honor in order to preserve our individual ability to access, explore and fulfill our lives. It is really very simple: we need to acknowledge and honor the basic needs and lives of everyone else as if they were our own. Which means if we perceive our developmental imperative as requiring us to harm others, to inflict physical, psychological and/or spiritual harm: mutilation, deprivation, destruction, upon others, then we need to rethink how we are interpreting our perceptions. It is likely that if we find ourself having such thoughts that they are an expression of anxiety and fear. Emotions often stemming from, at sometime in our past, our having been harmed, significantly physically, psychologically and/or emotionally mistreated. And/or quite possibly that we are suffering from a neurological impairment resulting from an insult to our brain. Possibly from a physical or chemical insult, or resulting from experiencing significant prolonged stress. What is needed is an experience of pervasive healing: and that experience will not manifest by harming others. We now know our world, our planet (or those who are paying attention know) is one single, large, system. When we tweak the system, for better or for worse, there are systemic consequences. For centuries we have had examples of the systemic effects altering a single component of a system can have. If a person’s liver stops functioning: the person dies. The whole person, not just the liver. As human beings we are all sub-systems within, what we undeniably now know is, the larger, unified system which is the Earth. The danger we face is in continuing to think and behave as if each seemingly separate free-standing entity, whether a person, cow, tree, continent or ocean is an independent entity unaffected by the other seemingly free-standing entities around it. As a video which used to be shown before movies in the U.S. said: “There is no non-peeing section of the pool”. Our environment is like a large pool, it’s all connected and there is no “non-peeing” section. What happens to the ocean off New Jersey affects Shanghai, and vice-versa. With some events proximity makes some difference; the closer a place, a people, are to the event, the greater the impact. Yet even small doses of a poison, continued over a long enough period of time, are going to affect the whole system. Therein lies the problem with so many of the answers that industries and governments (and those controlling them) want to hand to the rest of us. So many, if not all, of the answers are lacking in adequate consideration of the systemic consequences of what is being proposed. Or, if the systemic consequences are being considered, there is a Machiavellian agenda afoot which gives little or no weight to the health and well-being of the majority of people on the planet. It is the cognizance of this latter possibility that underlies many, if not all, of the “conspiracy theories” we encounter. The “mainstream” culture in the U.S., the government, industry, media, seem to want us to view the systemic reality that is our planetary ecosystem only one component at a time. We’re supposed to believe there is no critical interconnection between the components (seemingly independent entities). We are supposed to ignore the system as a whole. In actuality, each part, each component, of our planet is in constant energetic, chemical and/or physical interaction, communication if you will, with every other part. Just as our body is a whole system with each part in constant communication, via energetic, chemical and physical affects, with every other part. What happens if our planet’s “liver” fails? This consequences of this interconnectedness has been referred to at times as the “butterfly effect”. That is an extreme, but not unfounded, conceptualization of the systemic reality we live within. It’s time we not only face this reality but alter our thinking and behavior to properly take it into account. Air pollution in China affects us all. The radioactive water leaking from the Fukushima reactor in Japan is poisoning the whole ocean. The inordinate materialism being promoted in advertisements, movies and other media from the U.S. is affecting the collective psyche around the world. You see, it’s not just about air, water, or soil pollution, it’s about everything. Including the physicality, mentality and spirituality of all people, everywhere. Some want to see our Earth as a being named “Gaia”. I have no problem with that. Whether our planet, our home is a sentient being or not really should make no difference in how we treat it (her). Our undeniable reality is that the Earth is our home, our only life-support system, and we need to give much, much greater respect and consideration to that reality than is being shown at this time. What are our natural resources? Essentially they are the inherent qualities of the planet we live upon. None of us created them or contributed to their existence. However, as we know, many if not all of them are necessary for our lives. Without the air, water, food, shelter, medicinal substances, that our provided by our natural resources we would die. Without the beauty and recreational opportunities inherent in our natural resources our lives would be much less enjoyable, if even tolerable. Natural resources include the plants that grow and the animals that inhabit the Earth. Natural resources are the source of all the raw materials that all products are made from. Even what scientists require in order to create “synthetics”. Without the naturally occurring base materials there would be no synthetics. We come to the Earth with nothing and everything we have while we’re here has essentially been provided to us by forces beyond our control. Everything. That makes the naturally occurring resources of our planet (and others) pretty valuable, doesn’t it? It is true that humans very often take a natural resource, add some ingenuity and work, and thereby create something more useful to human life than the raw material alone. Clothing, houses, automobiles, medicines, works of art, musical instruments, books, computers, jewelry, beer, wine! Humans have bred some plants to produce more or better food products than they did previously. However, it’s worked the other way with plants also, nutritional value has been reduced in some strains. And similar claims can also be made for about every natural resource. At some time one or more human beings have tried to create something with one or the other natural resources which has ended up being of less value than the raw material. Trial and error, we humans seem to do a lot of that. Somewhere along the line some people decided that because of some arbitrary situation in their life they actually own one or more natural resources. Maybe they were born into a “royal” family with a longstanding (but never the less arbitrary) claim. Or maybe they had friends within one or more governments that were ready and willing to pass laws that proclaimed they now have ownership of certain natural resources. In any and all of these cases, assertions of ownership have only worked because there were sufficient other people ready to support that assertion. All such assertions are arbitrary in that they are devised and implemented solely out of the volition of the human beings involved. In other words, if I say I now own New York, and if I can get enough people in positions of power and a sufficient army to support the claim, then I own New York. That’s how it works. We all came with nothing, everything that is, every single solitary natural resource on Earth, has been provided to us freely by forces beyond our control. Every product that exists is produced from these resources. Whether by design or default, currently we are allowing individuals or small groups of individuals to claim ownership of massive amounts of the Earth’s natural resources. Is this really how we want to conduct ourselves? This type of practice, among other things, leads to competition among the individuals and groups vying for ownership. It has led to wars and will undoubtedly lead to more if the practice is continued. It leads to inflationary, greed based pricing of the resources and works toward the impoverishment of the general population. The psycho/emotional effects of a competition/greed based culture in general are to be seen within populations around the world: fear, anxiety, disenfranchisement, depression, or vanity, narcissism. When enough people wake up to the reality that private ownership of natural resources, and all similar cultural structures, can only exist with the cooperation of the general population, then we will see significant change within systems take place. In the past this has often just meant that the group controlling the resources changes and the same greed/competition model stays in place. We need something better. We need to realize that as a species that our fates are inextricably intertwined. We need to realize the mutuality of our plight and then to act upon that realization. We need to utilize, to apply the magnificent body of knowledge that already exists within the disciplines of psychology, physiology, sociology, medicine, anthropology, ethics, and spiritual studies in the design and maintenance of our social and industrial systems. Economically we don’t need socialism, communism or capitalism. We need a hybrid born in knowledge and reason with the well-being of all of humanity as a goal! A key foundational piece of wisdom comes when we realize that, in general, looking at the basics of our biology and spirituality, what is good for one person’s body and spirit provides us with a model of what is good for the body and spirit of humanity as a whole. “Don’t play the victim to circumstances you created.” I saw that statement on Facebook and it hit me like cold shower. Wow. So simple yet so profound. I would alter it some to read; “Don’t play the victim to circumstances that you helped to create.” The latter statement sums up what is going on with the issue of illegal immigration to the U.S. The U.S., as a nation, is experiencing the consequences of decades of supporting tyrants and greed in Mexico, Central and South America and elsewhere. Everyone who believes it is too much trouble to pay attention to politics needs to wake up, politics can and will affect your life! What do we expect when the U.S. government, and U.S. corporations, have spent hundreds of millions of dollars supporting leaders and methods which render countries unlivable for vast numbers of the populations of those countries? We cannot as a people continue to ignore a simple reality; we need to be working to build a culture which is supportive and nurturing of whole and healthful human life. And we need to support such efforts elsewhere. What we are doing now, as a matter of national policy and culture is worshiping the “bottom line”. It’s all about the money. We have become a species in which too much of what we, as a species, are engaged in seems hellbent in destroying our environment…and ourselves. Often or always in the name of corporate and/or personal “profit”. It seems human kind these days has narrowly defined “profit” to include only monetary or material gain. This is proving to be a very costly error in reasoning. In order to correct things one thing is certain, there needs to be balance brought back into our economic reality. There is an absolute need for us, as a species, to recognize our mutuality and keep each other’s well-being in mind. Why focus on something so mundane as money rather than lofty sentiments about love and/or spirituality? Because what is happening with the material wealth we possess is a visible measure of what is happening with our spiritual reality. No matter all the high platitudes being written and spoken, the truth of our internal state is apparent in our external state. We usually think of external/worldly change happening as a result of an internal change, however, the reverse can also be true. Sometimes when we realize the absolute need for an external/worldly change, and act upon that realization, the dynamics precipitate a fulfillment of the change within our psycho-emotional make-up. So, as we look around at the increasing poverty and suffering of the many on one side of the scale and the extravagant, inordinate wealth of the few on the other, isn’t it obvious what needs to be done? The only question is how is it going to happen? Because when things get too far out of balance, the natural tendency toward a viable balance will assert itself, that’s as inherent a reality as gravity. (As above so below, as below so above.) Will it happen in a caring, thoughtful manner or in a chaotic, traumatic series of events? Like so much else that happens in this world, it’s all up to us. July 2017: I need to add that the predatory exploitation of developing and/or “third-world” countries has not been limited to the United States or corporations headquartered in the U.S. Also, the problem of refugees and immigrants is not limited to the United States.